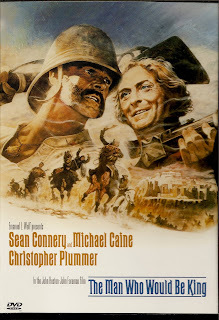 In 1975 John Huston released his epic version of a 15 page short story by Rudyard Kipling and 2 Geniuses collided. The film is long, about 2 and 1/2 hours, but when it is over you are left longing for more. Set against the backdrop of India during the late 1800's the scenery and costuming are perfect. The opening scene alone, which is a smorgasbord of an Indian market place in Calcutta, is as accurate today as it was then. From the theft of Rudyard Kiplings watch by Peachy Carnahan in a Calcutta train station, a chain of events ensues locking the three main characters in a saga that will take "three summers and a thousand years" to come to a conlusion. Their relationship is grounded in the fact that they are both Masons and bound to one another by this connection. The implications of this are far reaching and though Kipling is only in the movie at the beginning and at the end, he is with you through the entire story in spirit. This is Direction and Screenwriting at it's best! Character development is the key to writing a screenplay. More so when the entire screenplay comes from a short story with so little clue as to who these guys really are. Huston delivers on that score, serving up 2 of the most cagy and uncanny anti-heroes to ever cross a screen. The 2 principal characters, Peachy Carnahan and Danny Dravot(played by Connery)are so accessible, so familar, and grow so close to you, that you want them to reach their goal. The journey across the mountains and through an avalanche is awe inspiring. They face death more than once, singing and rejoicing in the events that have lead them to their fruitless ends. But another event saves them and they find themselves in what is today the mountains of Northern Afghanistan, past the Hindu Kush, where they intend on establishing themselves as Kings. Meeting the local Chieftains they vow to help conquer all their enemies. They only wish to take some "small souvenirs" as a reward. But somewhere along the way, being King becomes attractive to Connery and they push on past their original intent. This leads to disaster and also to one of the most noble scenes on film as Connery pays the ultimate price for having lost sight of himself. Of special interest is the character Roxanne, who is played by Caines wife Shakira. She literally fell into the role at dinner one night when Huston was discussing who they could cast. She is one of the events that trip our heroes up as they struggle onward towards their goal of becoming Kings. An extraordinary work, this film should not be missed. To make a 2-1/2 hour epic from a 15 page short story takes some talent and imagination. This movie has both in abundance.